Good hospitality from the owner of the hotel, very nice hotel for night stay. Food is good. Location is ok. You can view high mountains from the backyard of the hotel. 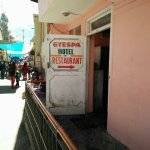 Overall its good hotel in budget. A budgeted way for a relaxed stay! Get quick answers from The Gyespa Hotel staff and past guests.